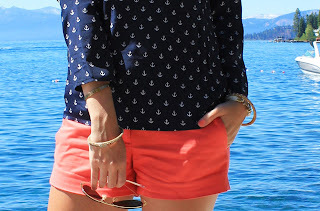 Nautical by Nature: Nautical Outfit of the Week: SF Blonde Anchors Aweigh! Nautical Outfit of the Week: SF Blonde Anchors Aweigh! Today I am featuring Ali from San Francisco Blonde. A fellow California girl, I fell in love with Ali's nautical outfit she wore on a recent trip to Lake Tahoe. OMGosh......love the outfit and Tahoe looks gorgeous! Love the outfit--never knew that Lake Tahoe was so blue! This is an adorable outfit! I wanted that blouse so bad, but I made the mistake of waiting for it to go on sale, and by then they only had like XS left. Sigh. Love it!! The coral and navy together is so cute!